Sticky leaf monkey flower and indian pink grace a slope in San Olene Canyon near Chantry Flats, Big Santa Anita Canyon. As the Spring days lengthen, look for Sticky Leaf Monkey Flower (mimulus aurantiacus) & Indian Pink (silene laciniata) in full bloom on your next hike out of Chantry Flats. Despite our lack of winter rains and snow, the grass covered hillsides of our front-country canyons still remain mostly green. It’s as if many of our chaparral flowering plants have a sense that if they’re going to bloom at all, then they need to do it now. The flowery scene shown here would typically take place during the warmer summer season, almost a couple of months out from May. 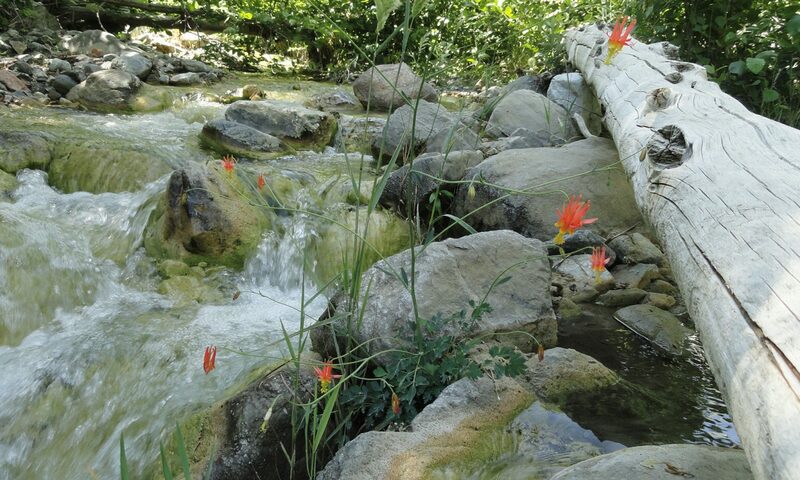 Both the Upper Winter Creek and Gabrielino Trails provide the best viewing of wildflowers. If you take the Upper Winter Creek Trail, your best opportunities for seeing flowering plants will be between the Chantry Flats picnic area and the high point of the trail where it begins to descend toward Hoegees Campground. On the Gabrielino, most of your opportunities will be between Fern Lodge Junction and Cascade picnic area. Whichever way you go, the ideal locations will likely be out in the direct sun or semi-shade. Besides finding the above pictured flowers, you’ll likely see Ceanothus, commonly known as buckbrush or wild lilac with its’ clusters of tiny, fragrant, lavender flowers. Also, look for Phacelia, with beautiful purple, trumpet-shaped flowers. Vines of wild cucumber along with a myriad of small, white flowers (non-edible) can be seen tangled throughout lots of the shrubs this time of year. The spiked seed pods are bright green and soft in the Spring. A great website to visit for details of hundreds of plants, including photos of wildflowers in the San Gabriel Mountains is: www.calflora.net. This is a really good time to be out hiking the front-country. The temps are still mild and a number of canyons still have some flowing water.